"Good morning, you're through to Whip-it-Round Parcel Delivery Services. How may I help? "...OK, I can see that we have a time and a date for despatch and... No, no delivery date. No, I can confirm that your parcel has not yet been delivered. Well yes, six weeks is rather a long time to wait. No, I'm afraid that the system can't tell me where it is at the moment. Please sir, calm down. No, I'm not able to tell you when it's likely to arrive, or even if it's going to arrive. "Please sir, could I ask you to moderate your language, otherwise I will be forced to terminate this call. I do appreciate that sir... well, no I wouldn't... of course, but then it's not my package, is it? The thing is, the reality is that it's really rather unlikely that it's going to turn up at all after all this time. It's most likely either lost or stolen. "Well, you say that but actually it happens rather more often than you might imagine. Think about it: a total stranger turns up in a van and you just hand over a valuable item without a second thought. What do you think is going to happen? He's going to have it away with your stuff, that's what's going to happen. Our drivers are very poorly paid so inevitably this sort of thing goes on all the time. "Quite right, compensation! I'd feel exactly the same way in your situation. Let's see what we can do for you... Ah... Now then, well yes, there is a bit of a problem. You see, you opted for the Standard Service. Oh no, nothing wrong with that. Nothing at all. It's an excellent service... Oh but I disagree, it really is excellent... Well, because the vans are so clean. And the drivers are really friendly. Well, I understand what you say, but for many of our customers that's enough, and the issue of whether their parcel actually gets to its destination is really a rather minor one. No, I stand by my description. No, there's no problem with the Standard Service; the problem is the insurance. "Yes, the insurance. Specifically: there isn't any. Now, if you'd gone with the Super Quality Red Ribbon Service, not only are the vans they use really, really clean, but your parcel would have been covered in the event of theft, loss, combustion, water damage and deliberate mutilation by members of our staff. Oh absolutely - you should take a tour of our warehouse some time. They're kicking seven bells out of the stuff down there. Honestly, sometimes you walk in there and it's like a bombsite. "It certainly is unacceptable. I couldn't agree more. I feel sorry for the poor sod who has to go in an clean up after them, and sometimes all that noise puts me off my lunch. But listen to me talking about my problems when we should be discussing yours. In short, vis-à-vis your missing package, you don't have any insurance so you don't really have a claim. "Well yes, I see what you mean but the fact is that you don't have any insurance so you can't make a claim. "I don't doubt that, and indeed you might be right, but the bottom line is that you don't have any insurance so you can't make a claim. "Yes, yes, yes. Everything you say is perfectly reasonable but at the end of the day, all things considered, weighing up all the options, you don't have any insurance so - look must I keep saying this over and over again? 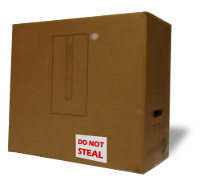 Legally, once you have entrusted your parcel to us, we are entitled to steal it, break it, throw it in a hedge, leave it up a tree or pretty much do whatever the hell we want with it. "Unless, that is, you have the proper insurance. Which you don't. As we have established. "Well yes. I think that would probably be best. I don't blame you sir, I really don't. No, if I was in your position, I'd take my custom elsewhere as well. Not at all sir. Goodbye."